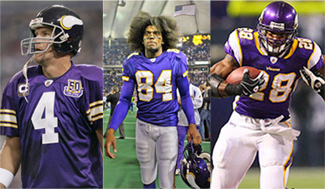 Anyway you shake it down, it is clear that the Minnesota Vikings have a legendary dream team of veteran offensive power. I have long lamented the Vikings’ release of Randy Moss back in 2005, when he was no doubt THE deep threat of the league. Now, the trinity is complete. Not since when the Heat brought together The King with D-Wade and Chris Bosh has there been higher expectations for a trio of professional athletes. Will the Vikings pull it off and beat the Jets on Monday? The Minnesota fan in me says yes, but if they do, it will no doubt be a hard fought victory against Mark Sanchez and the Jets’ D on home turf. No doubt, the Vikings have indeed struggled so far this season, and although Moss fills the WR gap for Brett, the two have yet to play together on the field. Still, I am going to call this one 31-17 for Minnesota. If the Vikings win tomorrow, and win big, this will be huge news for Minnesota fans holding out for the ultimate win. Personally, I would just be happy this season seeing Favre and the Vikes pillage, loot, and torch Green Bay as they did last year (twice). That would be a good season for me. Speaking of which, congrats to Donovan McNabb and Washington for the OT victory against The Slack this afternoon. I used to support the Skins back when I lived in Maryland. It’s always nice to see an underdog team led by a veteran QB win, especially when it is against the cheese-heads.